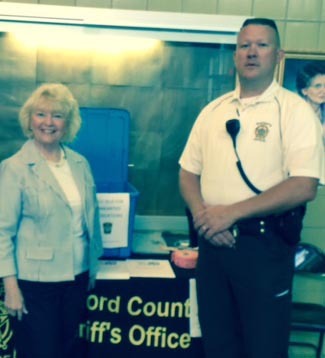 As a way to help senior citizens rid their homes of unwanted or expired medications that could be a danger to others, Bradford County Sheriff C.J. Walters will again sponsor a prescription drug drop-off collection box at Rep. Tina Pickett’s Senior Expo on June 10. ATHENS – Rep. Tina Pickett (R-Bradford/Sullivan/Susquehanna) invites area senior citizens age 55 and older who live in the 110th District, along with their families and/or caregivers, to her 16th annual Senior Expo, to be held Friday, June 10, at the Athens Lynch-Bustin Elementary School, from 10 a.m. until 2 p.m.
“This Senior Expo allows me to interact with seniors and their family members and put them in touch with a variety of programs or services that may help them,” Pickett said. “At a typical Senior Expo, my staff and I have put a senior in touch with a volunteer activity, prevented them from being a target of a scam or helped them apply for the PACE or PACENET prescription drug program. New this year, the Area Agency on Aging will distribute $20 in vouchers per eligible senior as part of the Farmers Market Nutrition Program. Additionally, seniors can drop off unwanted prescription drugs for safe disposal at special collection boxes sponsored by the Bradford County Sheriff’s Office. Also at the Expo, North Central Sight Services will be sponsoring an on-site shredder to safely destroy documents containing personal and sensitive information, as a way to protect seniors from identity theft. The school is located at 253 Pennsylvania Ave. in Athens. From Route 220, take the second Athens Business Exit to Pine Street. Signs will be posted directing participants to school parking. Shuttle services will be provided from the school’s parking lot to the building’s front door. Anyone with questions about the expo can contact her Towanda office at (570) 265-3124 or her Sayre office at (570) 888-9011. To prepare for the Expo, her full-time district offices will close early on Thursday, June 9.